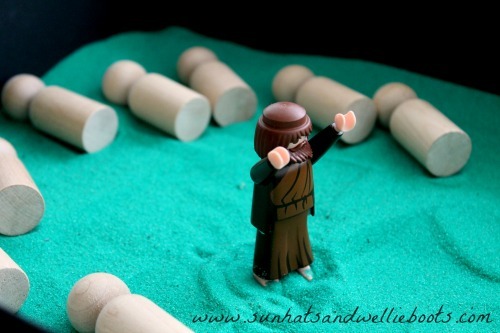 Explore the events of Holy Week with this simple Easter sand tray. Each day a new chapter of the story unfolds for children to discover. 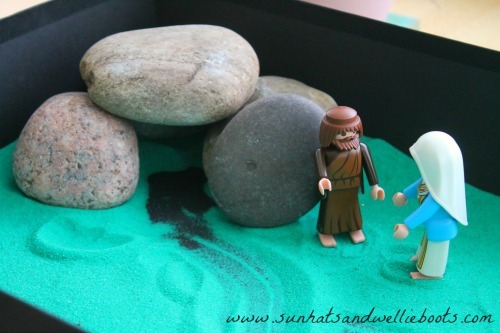 Sharing the Easter Story with young children can be a challenge, but this simple sand tray offers them a chance to explore the key events of Holy Week through open ended play. 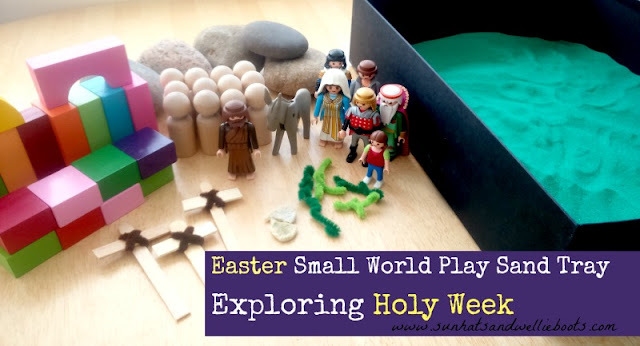 Using the small world play figures & props they can retell specific elements of the Easter story, & explore the friendships & emotions that run through the week. 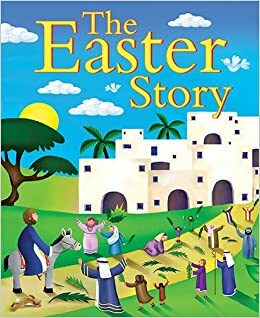 The Easter Story is packed highs & lows, & this play set up invites children to discover the excitement & joy of Palm Sunday when Jesus rode into Jerusalem on a donkey all the way through to the sadness & loss on Good Friday when Jesus died on the cross, to the joy of Easter Day. To create our sand tray we used a large sturdy box & added green coloured sand that we picked up from Early Learning Centre. 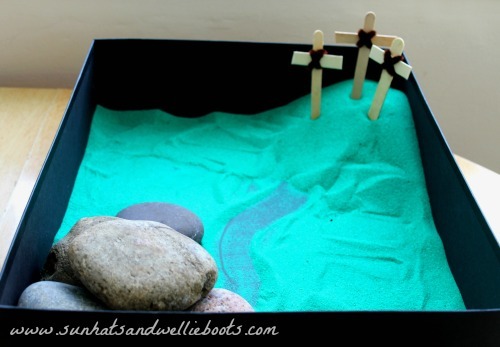 We chose green as we wanted this sand tray to stand out from our other sand tray activities. 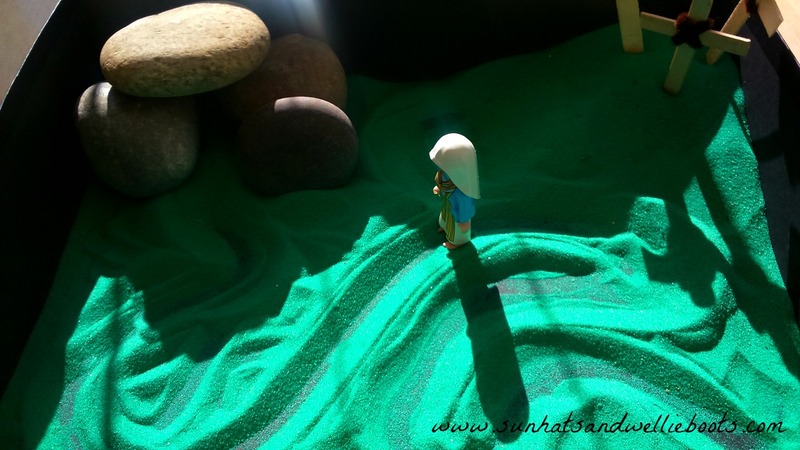 Along with the sand we used different figures & props & changed these every couple of days to relate to specific parts of the story, here's where our adventure began. 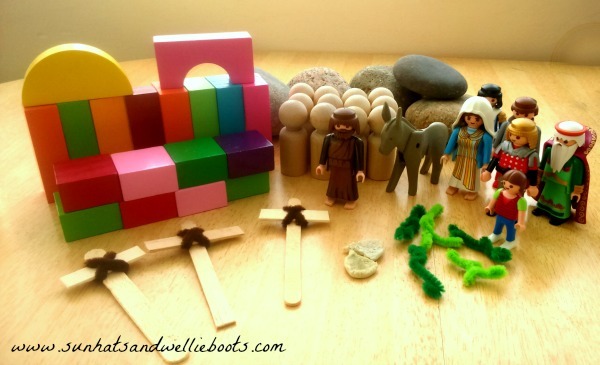 We started our Easter Story journey with Palm Sunday & to the sand we added; a selection of wooden building blocks, a Jesus small world play figure (we used Joseph from our Playmobil Nativity set, along with Mary & a couple of shepherds & kings which became figures for the crowd), & some palm branches that we made from sections of green pipe cleaners. 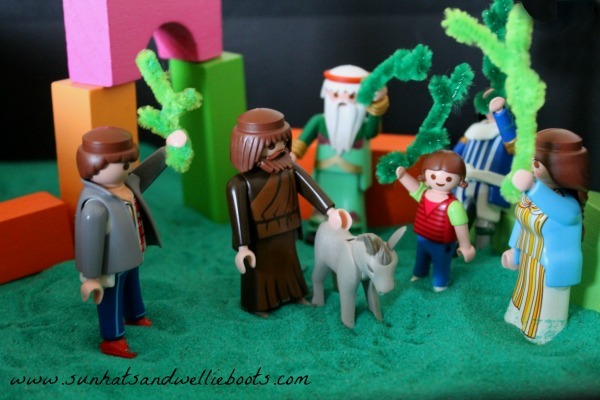 We also added a toy donkey, & alongside the sand tray we left a copy of the Easter Story by Juliet David, a book with a simple short text & bright bold illustrations recounting the events of Holy Week. 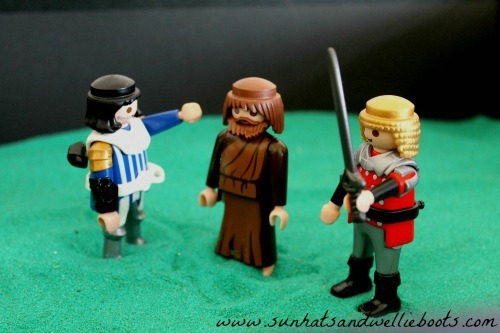 With the building bricks we built the walls of Jerusalem & an archway for Jesus to ride through to greet the crows who were eagerly waving their palm branches to welcome him. The branches were then laid on the ground to make a 'carpet' for Jesus to walk over. We left the figures to be explored in the sand tray for a couple of days before we moved on to the next part of the story. 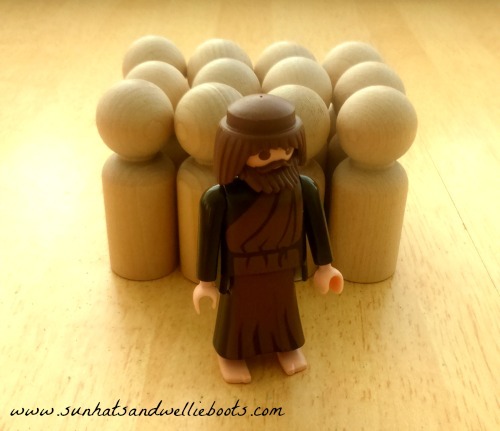 For this we added a dozen wooden figures to represent the 12 disciples, we left ours plain but you could decorate each one to represent each of Jesus' followers. 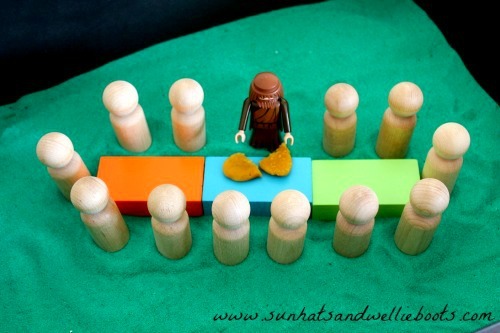 As we added the wooden figures we removed the other small world play people & a few of the bricks. We read about the Last Supper & created a simple table for the disciples to 'sit' around & added a small amount of play dough to represnet the bread. We talked about Jesus breaking the bread & what it meant to His disciples, sharing Jesus' words; "Do this in remembrance of me." The play dough could be broken & shared again & again, & if it got too sandy it was easy to replace with a little more. After Jesus & His disciples had shared their special meal, they left & went into a garden to pray. For this part of the story the table/bricks can simply be moved away so there is only the green sand (garden) & the figures to explore. In the photo below the disciples are asleep & Jesus is praying in the garden alone. 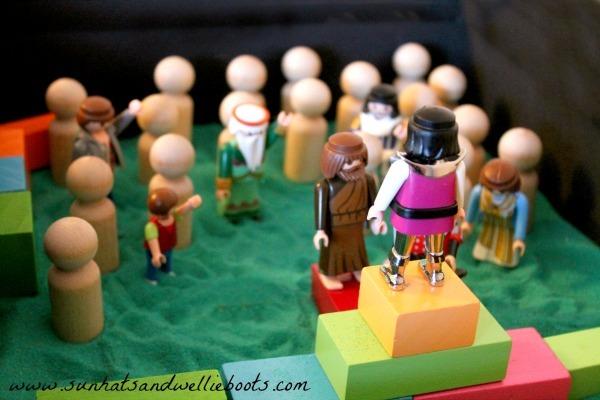 To explore Good Friday we added all the figures & bricks to the sand tray & created an area for Jesus to stand before Pontius Pilate & the crowd. Pilate asks the crowd that has gathered what he should do with Jesus, & the crowd shout that Jesus should not be set free. They have decide that he should die. To create the Easter Garden with the crosses symbolising where Jesus died & the tomb where his body was laid we made simple crosses from lolly sticks secured together with thin pipe cleaners, & placed them in a mound of sand which became our hill. 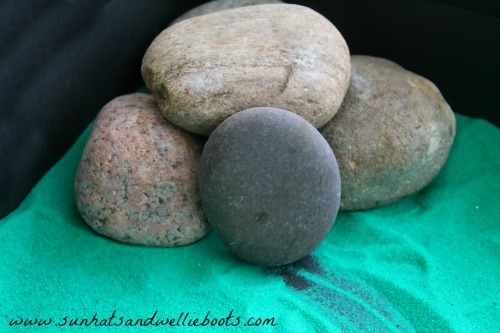 We built the tomb using 4 large pebbles along with a round stone which we used to seal the opening. 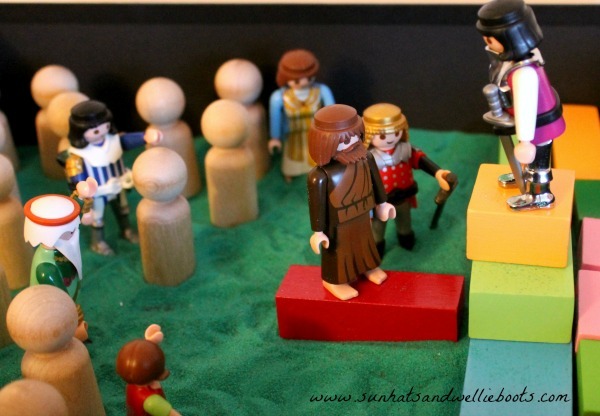 For this part of the story we focused on symbolism rather than action & had no small world play figures in the sand tray apart from Jesus in the tomb. 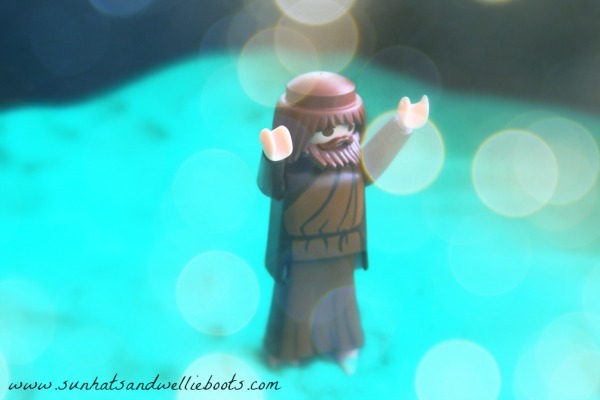 Instead we introduced lots of "I wonder..." questions like; "I wonder how Jesus' disciples felt now?" "I wonder how the people who were in the crowd are feeling now?" "I wonder how the sky looked?" "I wonder how it felt in the garden?" This opened up lots of discussion about emotions & those times when we've felt sad, scared or lonely & why. For Easter Day we left the tomb & crosses where they were & created a path in the sand for our Mary figure to follow. The path changed size & shape as different fingers moved through the sand & left their mark alongside Mary's footprints. It is only when Jesus calls her name that she realises He really is alive again, just as He said He would be. Hallelujah! 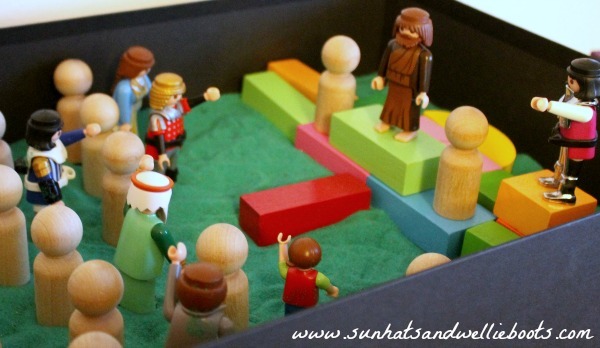 Our Easter sand tray has been explored countless times & key parts of the Easter Story have been played out again & again, especially the Last Supper & Easter Day. 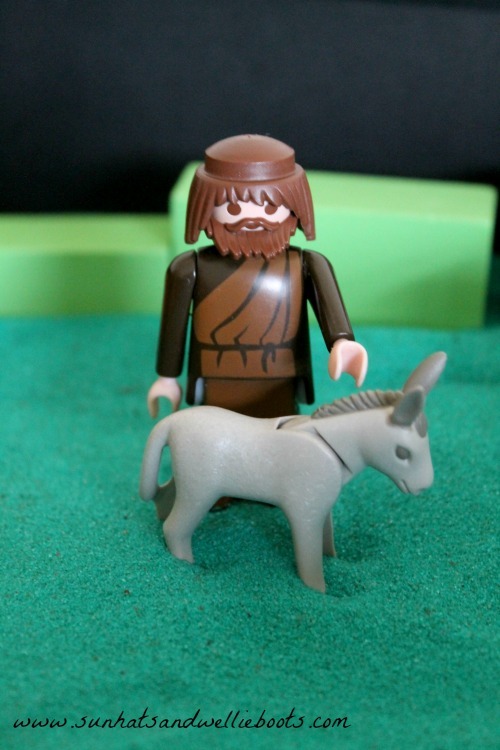 My little storytellers have had Mary & Jesus dancing around the garden in happiness, Jesus showing Mary around the inside of the tomb, & at one point members of the crowd were having donkey rides on Palm Sunday. But through these explorations we're discovering the central person in the Easter Story, & discovering His care, friendship, faith & sacrifice. 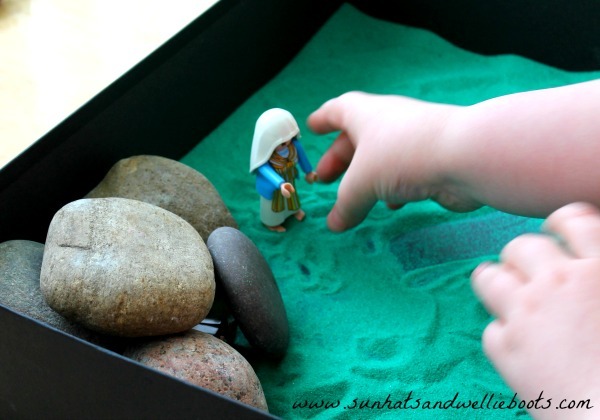 If you don't fancy changing the contents of the sand tray during the week as we did you could leave the sand tray out with a basket containing all the props & figures to explore alongside it. 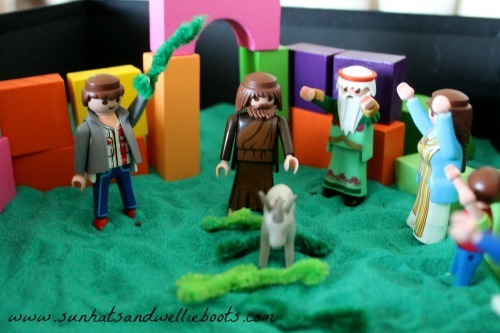 However you use this play set up I hope the children who encounter it will discover more about Jesus, & the amazing journey of Easter.